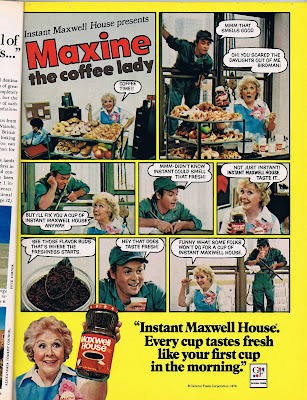 Ah... the good ol' days... when television ads had recurring characters like Rosie and Mr. Whipple and the Whirlpool repairman and Morris the Cat. Another similar ad campaign in women's magazines were the Virginia Slims "You've Come A Long Way Baby" ads. Using sepia-toned photos, the reader would read about a lady in the historic past trying to sneak a cigarette smoke, being discovered, and paying a comical penalty.